Indian Textile Engineers Printers & Printing Systems are open based Systems, meaning that they can be connected to computer using different operating systems and software, employing dye stuff and standard consumables from the prime international companies. 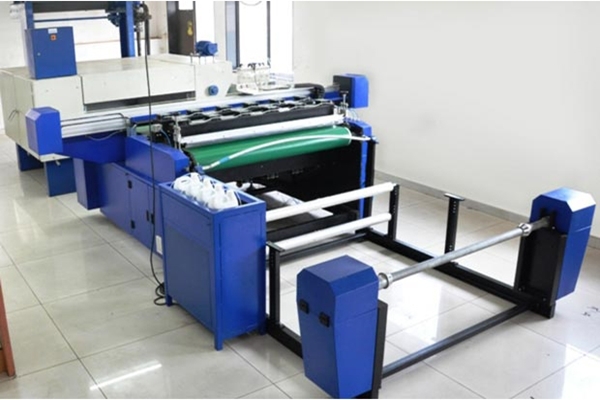 Indian Textile Engineers has been producing Textile Flat Bed Screen Printing Machines for 4 decades, from the single Ink-jet Printer. to the complete turnkey plants with Inkjet Traditional as well as Combined Technology. Indian Textile Engineer's entire know-how and technical solutions are completely established in India with technical components. made in India right from the software to the spare parts(excluding those standard components normally available in the market). Equipped with High Speed Multi Nozzle Inkjet Print Head (SG-1024). Equipped with High Performance Liner Module, Made in Germany. Accurate Production of suitable tints, tones & color gradients. Saves energy, water, space & operational cost. Model GB-9 - Production upto 100 sq. mtr. Per Hour*. Model GB-18 - Production upto 200 sq. mtr. Per Hour*. Model GB-27 - Production upto 400 sq. mtr. Per Hour*. Connected Load : 14 HP Approx. Single Phase : 10 HP. Three Phase : 4 HP. Printing Width : 1600 mm, 2500 mm & 3200 mm. Number of Colors : C M Y K (O R B Gr Optional).